An extended, detached bungalow occupying an elevated site within a popular residential location. Internally, the property is deceptively spacious and immaculately presented throughout. Accommodation comprises hallway, living room, sitting room with access to the rear garden plus an impressive open plan kitchen – dining. Further investigation reveals two downstairs bedrooms – one of which is currently utilised as a study plus family shower room and utility. An attic conversion offers the occupier a degree of versatility to the layout – currently utilised as 2 bedrooms, one with ensuite. 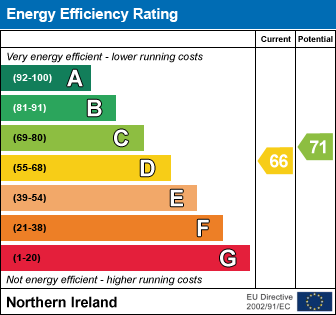 Further enhanced by uPVC double glazed windows and gas fired central heating. Externally, a tarmac driveway offers ample parking and leads to an attached garage. The notably private, low maintenance, landscaped rear garden benefits from a sunny aspects and offers sea views from the upper terrace. Conveniently located just off Croft Road, Ardmore is a quiet residential area yet within close proximity to Holywood town centre and delightful walks including Ballymenoch Park and the North Down coast. Leading local schools are on your doorstep and Holywood railway halt benefits from rail links to both Belfast and Bangor. We are confident this property will appeal to a range of purchasers from an active retired couple to a young, growing family. Composite and glazed front door to . . .
Oak wood laminate flooring, electric stove with polished granite hearth. uPVC double glazed sliding patio doors, contemporary wall mounted electric fire, light oak wood laminate flooring. Excellent range of high and low level units, laminate worktops, Hotpoint built-in oven and four ring ceramic hob, Hotpoint stainless steel extractor hood, contemporary single drainer ceramic sink unit with mixer tap, built-in dishwasher, concealed lighting, uPVC feature splash back, Worcester gas fired boiler, grey oak wood laminate flooring. Built-in shower cubicle with Mira electric shower, low flush wc, contemporary sink unit, heated towel rail, fully tiled walls, ceramic tiled floor. Plumbed for washing machine, space / vented for tumble dryer, wash hand basin, built-in cupboards. Light oak wood laminate flooring, range of built-in wardrobes, Velux window. Light wood laminate flooring, excellent range of robes plus built-in cupboards. Oak wood laminate flooring, Velux windows, storage into eaves. Panelled bath with mixer tap, low flush wc, wash hand basin with mixer tap, Mira Excel built-in shower unit, heated towel rail, part tiled walls, ceramic tiled floor, stand-alone storage unit. Oak wood laminate flooring, storage into eaves, feature arched picture window with sea views. Tarmac driveway with parking for two vehicles leading to . . . Mainly in lawns with border firs and flower beds with variety of plants and shrubs. Outside tap and light. Private low maintenance cleverly designed rear terraced garden, easily maintained with flower beds, fabulous sea views from the upper terrace. Travelling up Croft Road, turn right into Ardmore Road. Ardmore Heights is then on the right hand side. Check out the property I found on PropertyPal.com: 41 Ardmore Heights, Holywood BT18 0PY.